Situated half an hour’s drive east of downtown Frankfurt, the course at Hanau-Wilhelmsbad dates back to 1959 when 9 holes were hewn from the beautiful woodland estate of Prince Wolfgang of Hesse, hereditary Prince of the Finnish monarchy. Two years later, the layout was doubled in size to a full 18-hole course and so, for the last half century, this classic parkland track has complemented the Gothic castle, hermitage, pyramid island and gardens that lie within the 300-year-old walls of the estate. From the championship markers the card specifies 6,800 yards with a par of 71. However, the members get to play two of the long par fours as three-shotters and thus deal with a more palatable par 73 at 6,600 yards. Hanau-Wilhelmsbad used to stage Tour events at a time when infrastructural demands amounted to “must have a clubhouse and accommodate a handful of spectators”. The course record still sits at only three-under-par from the back tees, although two albatrosses have been recorded. Interestingly, hole 7 used to be the longest par five in Germany, but they shortened it to make it reachable for long hitters! The very old trees are not groomed to perfection, but to a very natural standard and with an eye for detail. Fortunately, the price to pay for the beauty is not too high, as there is room to play on most holes, and even though some undulations would have been nice, the layout is sufficiently variable to keep the connoisseur engaged. A handful of ponds and a meandering creek provide a couple of carries that are very keen. Legend has it that a former Hanau club president said he would give his daughter only to a golfer able to carry the creek at #11 from the tee. The bunkers are also worthy of a championship layout, as are the fast and tricky greens. It's an inspiring course to play and while it may not be the most strategic, it certainly has its twists and the visuals are top-notch parkland. 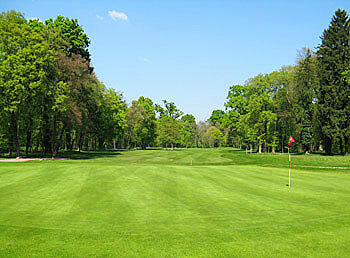 To me, Hanau-Wilhelmsbad is one of the best courses in the Rhein-Main area. Mature course in beautiful setting in the middle of the forest, with lots of old trees coming into play and beautiful flowers. Good course condition when I played it and decent practice area. Club house was a bit of a disappointment though.